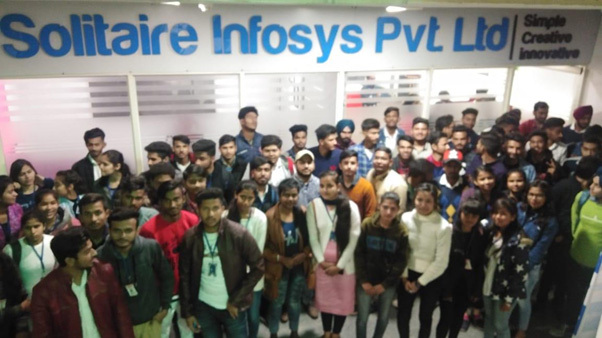 The Objective of the Industrial Visit is to help students gain first hand information regarding functioning of the industry which presents the students with opportunities to plan, organize and engage in active learning experiences both inside and outside the classroom. To experience chemistry at work. To become aware of the role of different people in an organization. To recognize the need for Health and Safety in the workplace. To focus students of specific aspects of their studies. 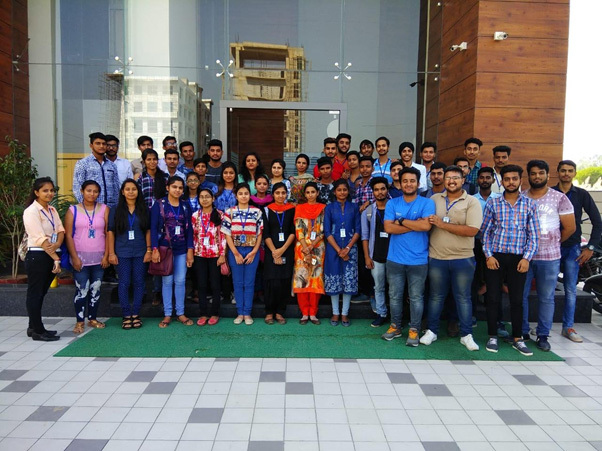 22nd September,2019.A group of 80 Students got an opportunity to explore work culture of Software industry and learn about the career oppurtunities in Software industries.Ms. Poonam, Ms, Hina, Ms. Kanika and Ms. Ruchi accompanied students to CSSoftSolutions Pvt. Ltd. Mohali. As said by Francis Bacon that “Travelling in the younger sort is part of education, while in the elder sort it is part of experience”, thus, corroborating the quote aforementioned we the faculty members at Computer Science and Applications department felt the need for organizing an educational visit for the students to Xportsoft Technologies, Ambala Cantt on 13.10.2019 so that they can better understand the intricacies involved when we apply the theoretical concepts learned in their couirsework. 40 students of B.Voc Software Development and B.Voc BPO visited the company along with Ms. Ponnam Rani. 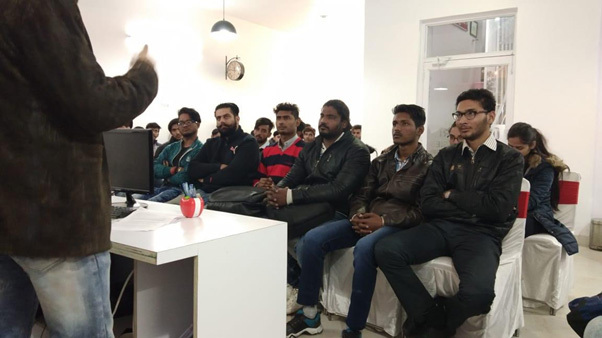 Another visit to Madrid Technologies, Mohali was organised on 14.01.2019. Ms. Ruchi and Ms. Poonam along with a group of 50 students of B.Voc Software Development learnt the latest technologies demonstrated by the IT Professionals of Madrid Technologies. They presented how software team work collectively to acquire, develop, analyze , test and maintain the software product. 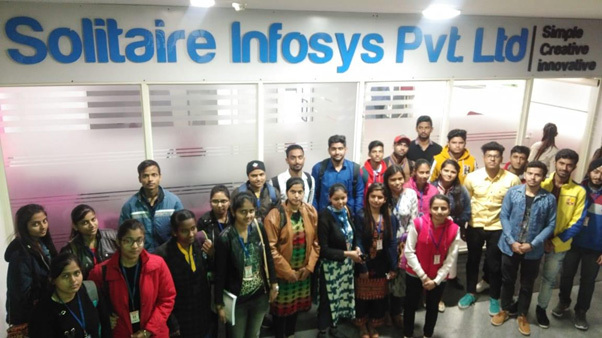 154 students of Department of Computer Science and applications got another opportunity to visit Solitaire Infosys Pvt. Ltd. On 02-03-2019 along with faculty members Ms. Pooname Rani, Ms mandeep, Ms., kamna, Ms. Preeti and Ms. Amandeep Kaur. Solitaire Infosys Pvt. Ltd. is a multi faceted IT organization serving expertise and delivering seamless and cutting edge solutions worldwide. They are a competent and revolutionizing team of skilled professionals with an experience and outlook to comprehend and serve the global market with unparalleled standards. They have efficiently and successfully served clients at par excellence with their array of insurgent technologies and augmented innovations in the field. They strive to offer tailored and integrated solutions as per their client’s perceptions and needs to satisfy their clients with the aim of creating long term and resourceful relations throughout. 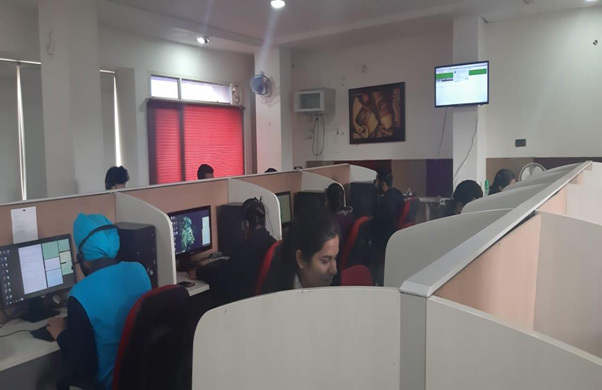 Students got the opportunity to work in their Digital Literacy lab and learnt about Basics of PHP and Project Devlopment Life Cycle.